Today the 7th graders focused on transportation. We saw many ways that people use to get around. 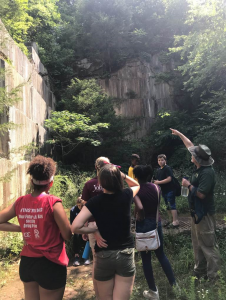 We kayaked at Ijams, and we had a history tour of the quarry. We then made our way downtown for a transportation scavenger hunt where our campers found various modes of transportation. We ended our day at the Southern Railroad Depot where we toured several train cars from 1915. Despite the heat, our campers had a blast together! We don’t have too many days left with our 7th graders. Thank you for all of your support and prayers during our camp. We greatly appreciate you!! Our eighth-grade students and leaders all had an exciting day learning to kayak at Ijam’s Nature Center! We practiced both single and double kayaks on Mead’s Quarry Lake and the students are all ready for our kayaking adventure on Friday! They all did such a great job and we are so proud of them. We also discussed the differences between the technologies and cultures of different wartimes in America. After eating lunch, we returned to Johnson University and visited the Museum of Archaeology on campus. The students were amazed at how people could preserve such old artifacts and kept asking questions about them. After the museum, we played some games involving various technologies used during the Civil War, World War I, World War II, and the Cold War. Students were amazed to find out that things such as velcro and powdered drinks were invented for wartime and not just for pleasure. We ended the day by visiting the McClung Museum in Knoxville. Our students have been working so hard and learning so much! Thank you for all of the support you provide for all of us!